Exceptional in every way! 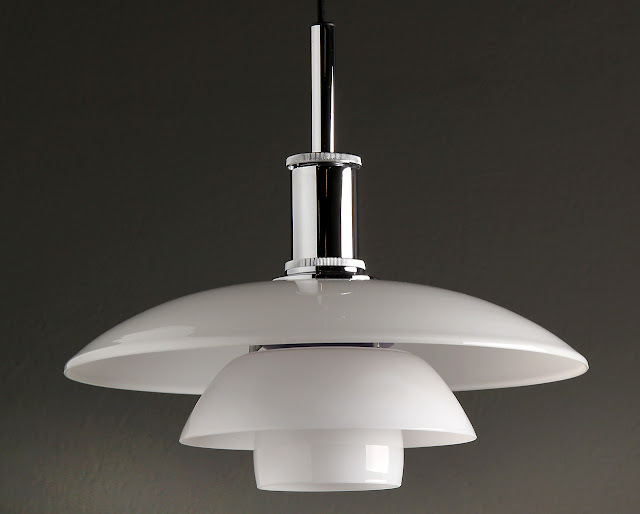 If you appreciate quality and you don't have tight budget, you will love the Louis Poulsen PH 4.5/4 glass pendant lamp. The PH 4.5/4 is the larger brother of the PH 2/1. With a diameter of 17.7", the PH 4.5/4 is the perfect light fixture for the dining room where it can be used to provide illumination above the dining table. The design of the PH 4.5/4 was a significant milestone in the career of Danish designer Poul Henningsen. It is one of his earliest creations and as such exhibits all the qualities we appreciate in a PH lamp. 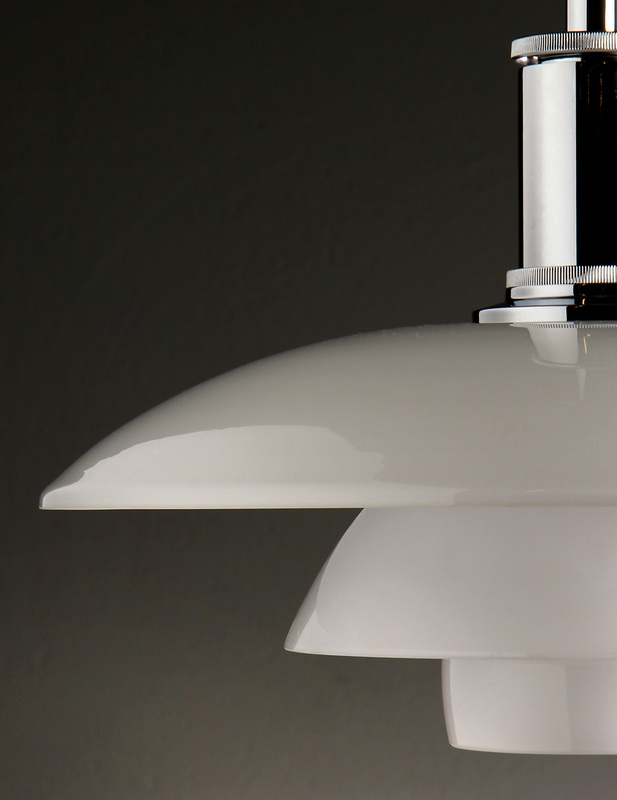 It came to be regarded around the world as one of the most perfect and recognizable lamps of Danish design. 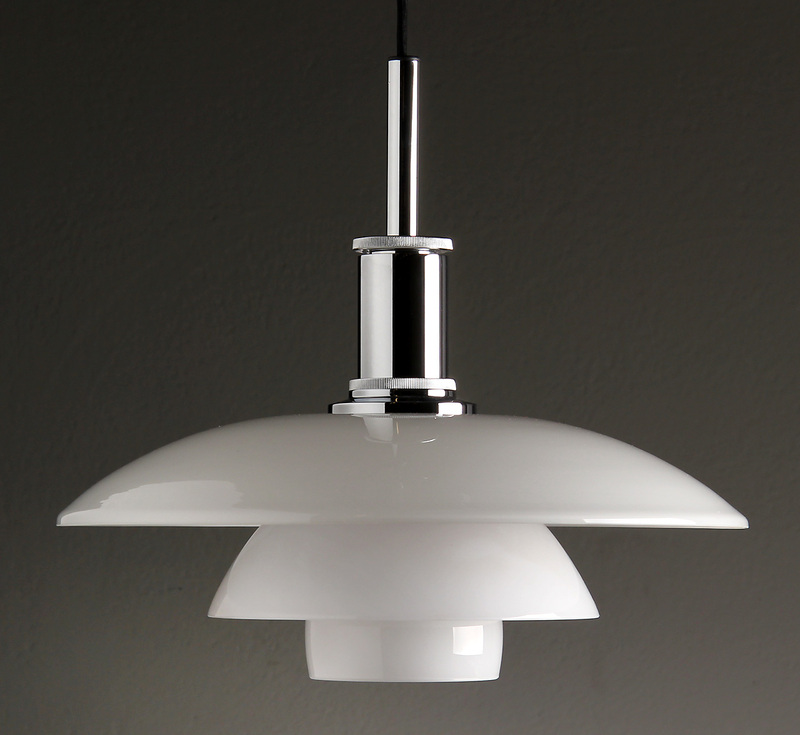 This refined and elegant pendant light fixture is executed in white opaline glass and chrome plated metal. 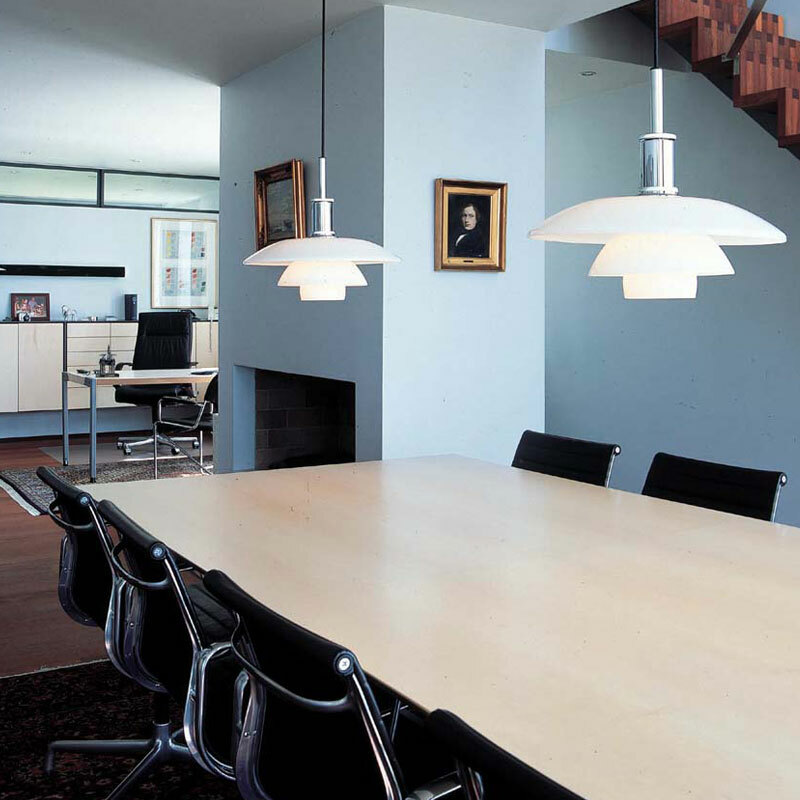 The Louis Poulsen PH 4.5/4 pendant lamp is considered to be a classical masterpiece! In production since 1926, the exquisite PH 4.5/4 continues to be one of the most popular Louis Poulsen lamps. A lamp that will most certainly compliment any interior setting. The fixture is designed based on the principle of a reflective three-shade system, which directs the majority of the light downwards. The shades are made of hand-blown opal three-layer glass, which is glossy on top and sandblasted matte on the underside, giving a soft and uniform light distribution. 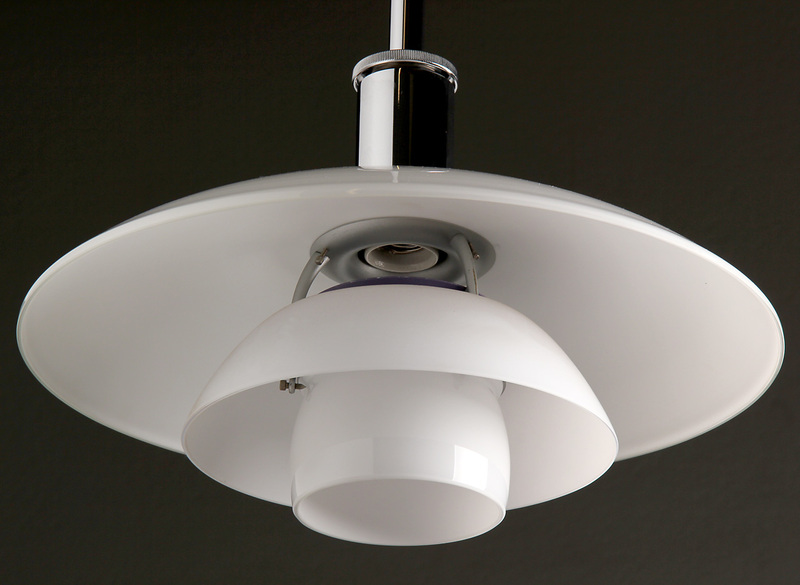 PH 4.5/4 Pendant provides soft illumination. PH 4.5/4 is based on the principle of a reflecting multi-shade system, producing glare free illumination. The shades are drawn over a logarithmic spiral, with the center of the light source placed in the spiral's focal point. 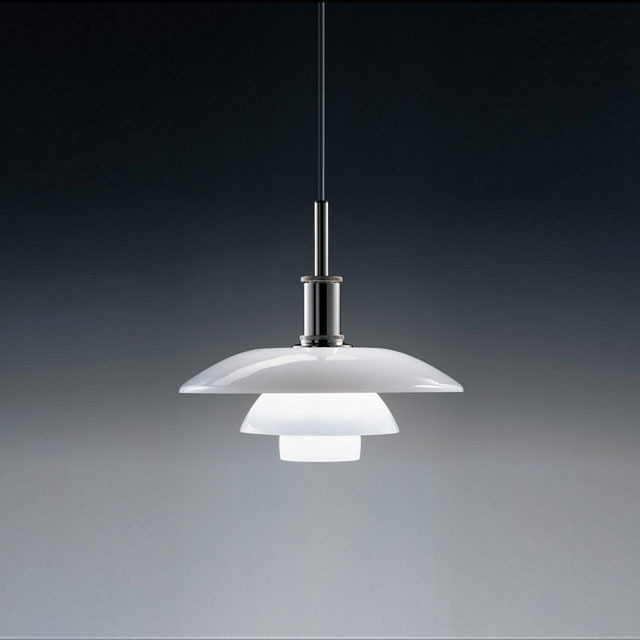 Poul Henningsen's PH 4.5/4 glass pendant exhibits a refined quality of gracefulness and good taste. Louis Poulsen uses the highest quality materials available and the most exacting construction standards, to create light fixtures that exemplify refined elegance and define traditional modernism. 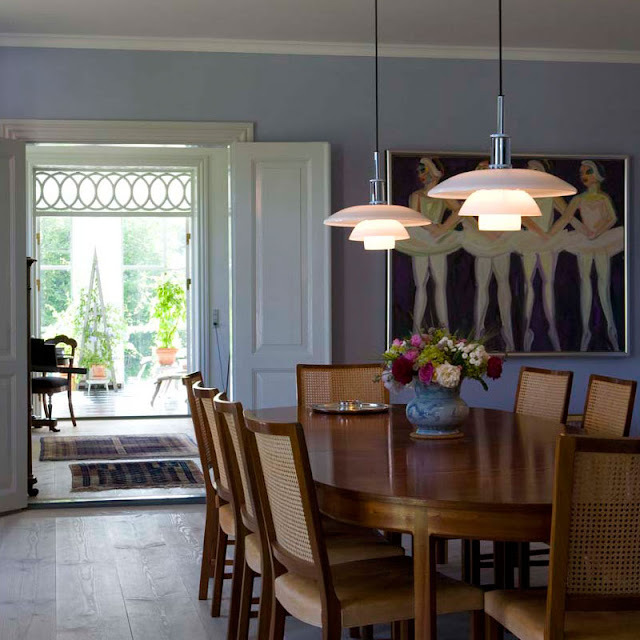 PH 4½-4 Glass Pendant is a member of the PH 3-shade family, and the principle behind the PH 3-shade fixture was made in a few hectic months in the winter of 1925-26 for a large exhibition hall in Copenhagen, Denmark called “Forum”. This is what PH said about his new fixture in 1926: “The real innovation in the PH-fixture is that it produces lighting which is both glare free and economical. 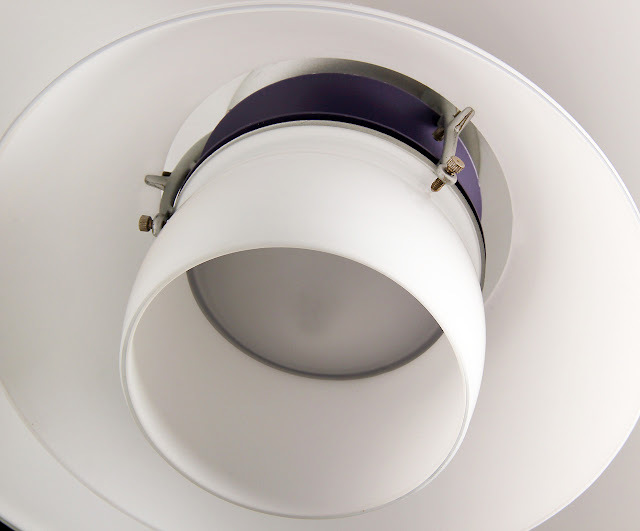 It is easy enough to create glare-free light (indirect and strongly shaded light) if a portion of the light is allowed to be wasted, and it is equally easy to make fixtures which are highly efficient if you ignore the fact that they severely irritate the eye (strong specular reflection, etc.) but it is an art to make light both economical and glare free.” Before the development of the 3-shade fixture, Poul Henningsen and Louis Poulsen had been working together on designing the fixtures for the Danish Pavilion at the World Expo in Paris, France in 1925. When Poul Henningsen designed the fixtures for the World Expo, he had already been playing with the idea that the logarithmic spiral was perhaps a suitable basis for a new shade structure. The combination of diffused reflection and a logarithmic shade curve also gave PH the opportunity to control the fixture’s glare and shading, as each shade would evenly decrease the amount of light emitted according to their distance from the bulb. The luminance transitions from shade to shade would also appear harmonic. The relative size of the shades and their positioning was determined by the need to reduce glare - the light disposition on the shades and the light distribution demands - according to some remarkably simple principles. From the beginning it was obvious that the concept was extremely flexible. Not only was it possible to get it in many different sizes, but also with different undersides - either a white painted surface, a silver-plated or gold-plated surface. 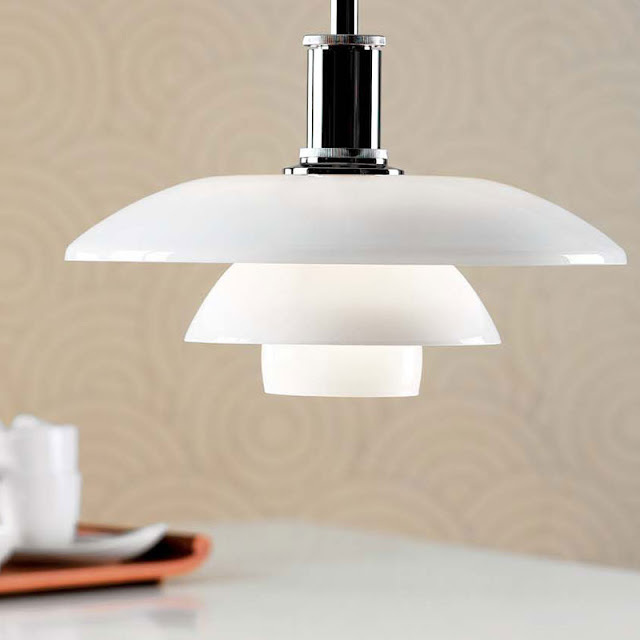 Purchase your PH lamps from the Louis Poulsen lighing specialists at Stardust. These different undersides were in order to achieve different lighting properties. PH envisioned that in a restaurant you would want the light to be warm and cozy and therefore you would use a gold-plated surface, as opposed to being in a hospital or dentist office where you would use the white painted surface. 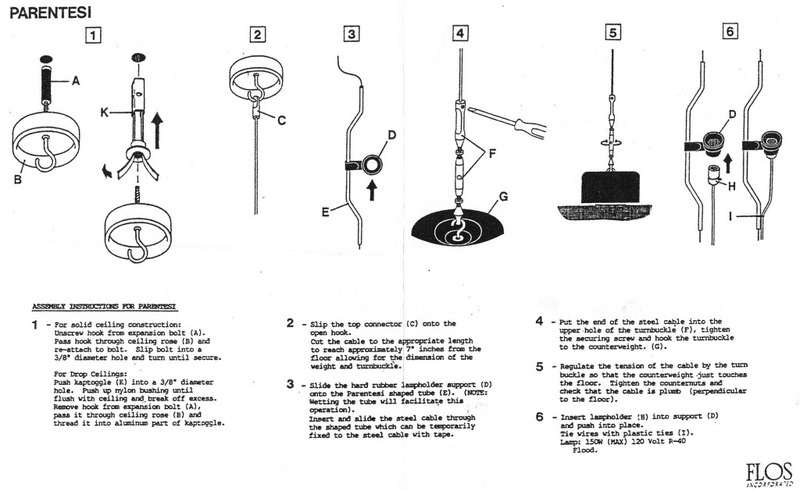 The first fixtures were all made with metal shades, but PH also wanted to develop a variant of the fixture, which would show a light distribution curve with less downward lighting. The result was shades made in opal glass with a sandblasted underside. The glass shades allowed 12% of the light to penetrate and contribute to the overall lighting of the room while most of the light was still reflected outward and downward from the matte undersides of the shades. 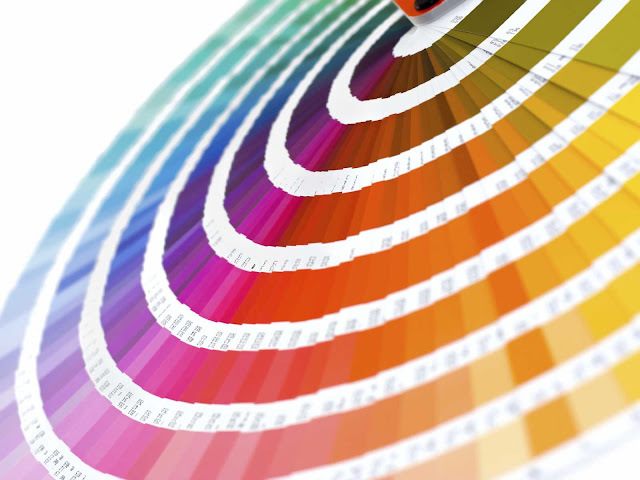 The same principles which governed the matte metal shades governed this new shade material. 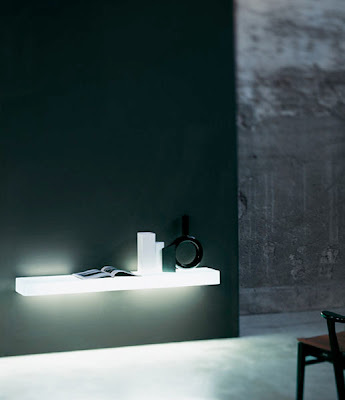 The PH fixtures were designed as a rational lighting system where the size of the shade, its material, and its surfaces could be combined mutually according to the nature of the assignment. Each top shade size had a corresponding set of middle and bottom shades such that the proportions between the shades were roughly 3:2:1. One of the basic models right from the beginning was a PH 5/5. The first digit in the fraction indicating the top shade’s approximate diameter, and the digit after the slash indicating that middle and bottom shades where “born” to this particular top shade. This means that the 5/5 had a top shade with a diameter of 50 cm, 31 cm diameter middle shade and a 16.5 cm bottom shade. This combination was good when the fixture was to be hung up high, but when the pendants were hung lower it was more suitable with a combination of a large top shade and smaller middle and bottom shades. This is how the PH 2/1 or 3/2 was born. 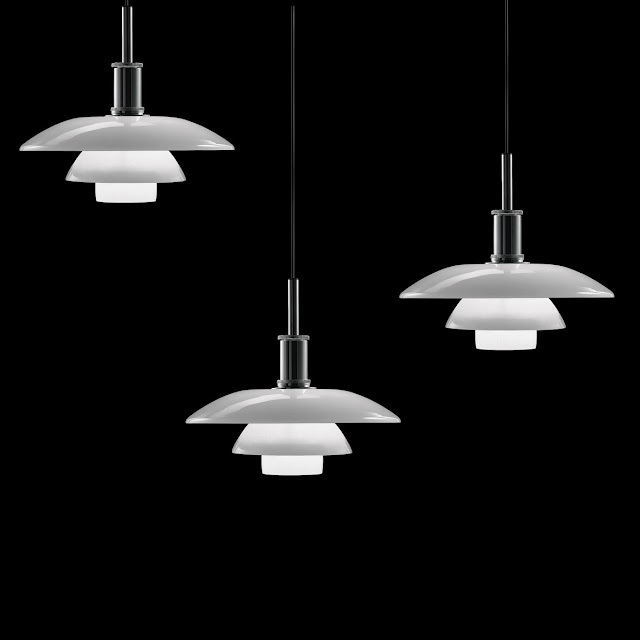 The PH3-shade system started out as a pendant solution but very quickly it also developed into other kinds of fixtures for tables, floors, walls and a great number of different chandeliers. As a result of using different sizes, materials, surfaces, colors and light sources, more than a thousand variants have been developed over the years.